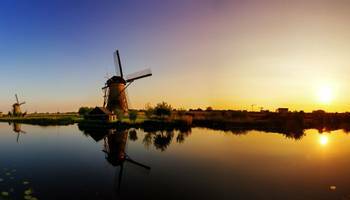 Though Holland is, in fact, a region that forms part of the Netherlands, it is often used to refer informally to the whole country. Amsterdam is the capital city and the official language is Dutch. The country has a long history of social tolerance, is known for having a high quality of life, and in 2013 ranked as being the fourth happiest country in the world. The name ‘Netherlands’ means ‘low country’ — roughly 50% of the land is only one metre above sea level, and about 26% of its total area lies below sea level. The country is divided into north and south regions by the River Rhine, and this has historically created both cultural and linguistic divides between the two areas. Although Holland has a higher population density than any other European country, an impressively large part of its area has been set aside as nature reserves. These protected areas consist mainly of polders, mudflats, marshes, reedbeds and sand dunes and are home to a large number of wintering birds, which makes Holland an ideal destination for a birdwatching tour.